Is there any place M28's are used in the car or are these complete garbage now? lol. It is of no use to the W204. what kind of led would fit into the festoon bulbs place? because i'm thinking of doing an interior color scheme, but i don't want to get all the led's and not have a match for the rear. to anyone else who wants to know: to find the bulbs you need, do an ebay search for festoon led's, and look for ones that are 44mm. Last edited by Magicman09; 05-25-2010 at 09:41 AM. Or am i going to have to buy a new dome unit? that nifty faded orange light acts as a "night light" and is barely noticeable. it's supposed to help illuminate slightly the gearbox area.. ARGGH!!! Should've read the entire post before I tried to do it on mine. I've cracked the cover now and everywhere I asked I need to buy the whole light unit. MB Australia sell it for $670!!! WTH!!!! can someone help with front map light removal? my car is about two months old and i'm afraid i might break something while forcing it hard enough. just use a flathead and push in and down. pops right off. i am going to swap the rear dome middle bulb to LED. but i am confused about what bandwidth of the LED bulb should i use. should i use 31mm, 36mm or the 42 mm one??? or they basically all fit ?? please help me answer this ! Last edited by kyokodan; 03-23-2011 at 01:05 AM. They don't all fit. 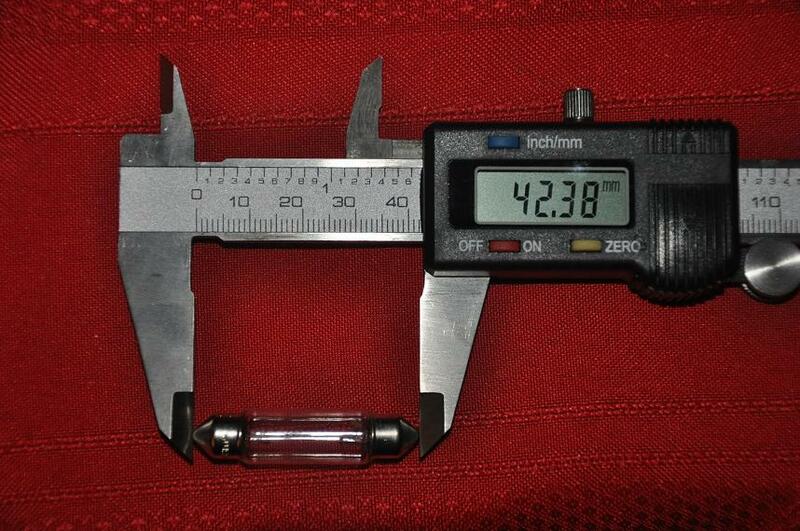 You need to measure the length of the bulb. From the picture it looks like 40+mm, but not sure exactly without actually measuring it. Never got around to taking apart my rear dome to LED swap. Randy, you remember the size of your rear festoon? 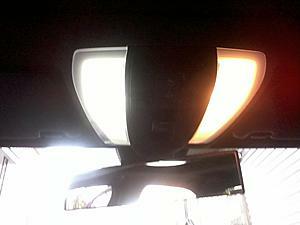 Do the interior front and rear dome lights on a 07' E350 pop off the same way? Actually, it's more 42mm. I just recently popped mine out a couple days ago and my 41mm work great. 44mm will probably also work though because these are end cap festoon grips which have some flex instead of dual clips which you have to be pretty precise. Sorry I don't have picture for door lights, but I changed on one door light with an LED bulb. Use a flat screw driver to pry it out at either end; it is just a bit tighter than some other lights. May I ask how to turn off the trunk light so that I can replace the bulb? I don't think there is a manual way to turn it off. If the trunk lid is open for more than like 5 minutes or so, it turns off by itself. I just use some cloth or even bare hand to quickly pull it straight out, very quickly so my fingers don't get burnt. Yeah, the rear is a little scary, but just give it a little effort and it'll pop out. Once I did it once on my own car, it was easy to do repeatedly. I was able to find a plastic wedge tool that works great at popping interior housing. Picked up about 50 of em and now including with my interior lighting package. The front interior light housing must be the worst MB design. The light cover cracks easily. Have tried using the credit card and it have managed to get it out 5mm or so but no knowing which end to pull, gave up as I couldn't see where the tabs were. MB must be running out of replacement front lamp fittings by now!! I just opened both the front and back to see if I can swap the bulbs to LED. 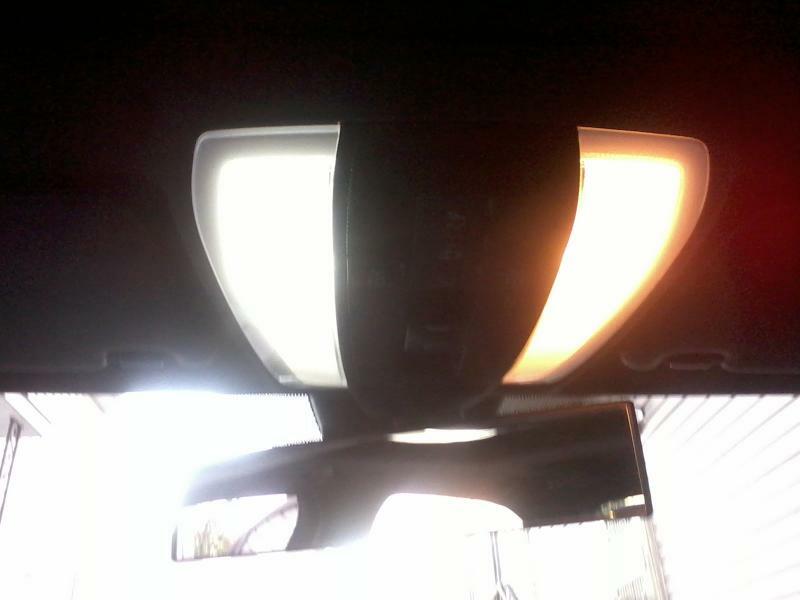 I attached a pic for reference, AZN LED on left and stock bulb on the right. Now I need to order more LEDs and change all of them.